Brassinosteroids (BRs) are sterol derivatives with multiple hydroxyl groups occurring universally in plants. Photosynthesis is the process which acts as base for the growth of the plant. BRs promote the activation as well as synthesis of enzymes responsible for the formation of chlorophyll. BRs regulate different components of photosynthetic machinery like photochemistry, stomatal conductance and enzymes of Calvin cycle. BRs promote photosynthetic carbon fixation by altering the functioning of stomata. The BR-mediated regulation of various photosynthetic components operates constitutively to promote net photosynthetic rate and ultimately, the growth and development of the plants. Thus, the role of BRs in regulating photosynthesis becomes an important area of research. 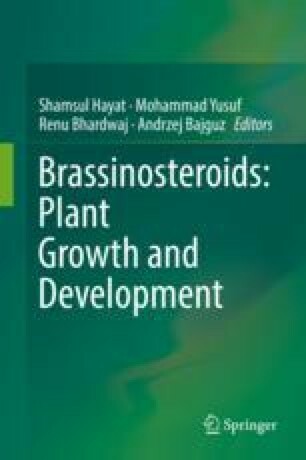 The present chapter summarizes the BR-mediated changes in photosynthesis and its associated components under normal and stress conditions.